In an effort to keep my WIP crafty projects in the lounge looking a bit tidier, I recently bought one of those woven seagrass baskets with a lid. I sorted through the three large plastic bags that had been beside the couch and kept out only the knitting and embroidery projects that I am currently working on. The rest of the needles and wool and so on were consigned to my yet-to-be-organised craft area in another part of the house. Keeping the projects tidy in the seagrass basket has been a bit of a problem though - I keep misplacing needles and patterns. So yesterday I made myself a couple of project bags, to keep everything separate. These are based on a similar one I bought at Loop in London (you can see it at the back of this photo). 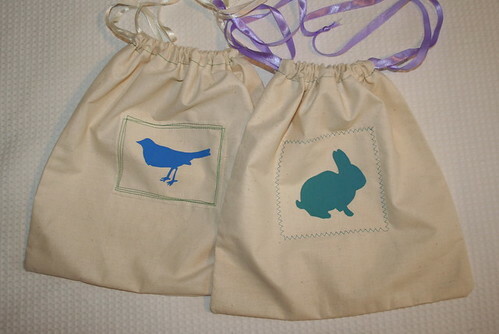 They are just simple drawstring bags made from unbleached calico - really quick and easy to make (I think the most time-consuming part was re-threading my overlocker/serger with white thread before I started!). I used the freezer paper stencil motifs I made a while back to decorate them. Now, I wonder how long everything will stay nicely organised this time? Fantastic idea. I think I too will be borrowing this...we haven't eaten at our kithen table in quite some time!! Great idea! I definitely need to make a few of these.